Four years on, the acrimony surrounding the first and only Test match in history to be forfeited has long since evaporated - at least from the minds of the England and Pakistan players. 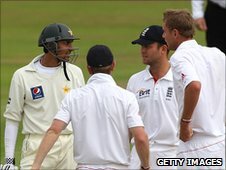 On 20 August 2006 the match was abandoned on day four when Pakistan declined to take the field after tea after earlier being penalised for doctoring the match ball. One of the principal protagonists that day, umpire Darrell Hair, is writing a book on the subject and the law relating to ball-tampering has now been adjusted to ensure that such a stand-off is unlikely ever to happen again. However, in order for the unhappy event to be firmly cast into distant memory the upcoming third Test between the sides at The Oval needs to pass off competitively, but calmly. Is it the dreaded vote of confidence for Cook by England announcing their 11 very early? Or am I looking into it too much? There are still rumblings in the Pakistan camp about Stuart Broad's flash of ill temper at Edgbaston to the extent that he is now being blamed for causing the fracture to Zulqarnain Haider's finger that has forced the characterful wicketkeeper to return home. 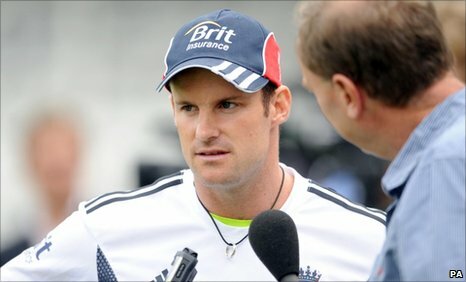 England captain Andrew Strauss, with an eye on long hot days in the field in Australia, has again spoken of the need for England to remain disciplined and focused when things are not going their way - a tacit reprimand for his pace bowler who pushes the line too often. From Strauss's perspective, it was not so much the ball-throwing incident - although he does not condone that - but the missed run-out during the following over when Broad, still distracted and angry, fired the return wildly over Graeme Swann's head, and the opportunity was lost. It is precisely the sort of thing that could be the difference between winning and losing the Ashes. Clearly the onus is now on Pakistan to arrest England's march towards a 4-0 whitewash. Mohammad Yousuf looks certain to return as Pakistan desperately seek some resilience to a batting line-up that has been blown away far too easily in the course of this series. It remains a lot for one man to do - especially one that has played such little competitive cricket recently - but he managed an unbeaten 40 against Worcestershire last week and has an outstanding record against England. With cloudy and unsettled conditions expected to prevail throughout, Pakistan's swing bowlers should have the elements in the favour once again. This will not come as great news to Alastair Cook, whose position must now be under the microscope. I can see why the selectors gave him this opportunity on what should be the flattest pitch of the series, but should he fail again, he will have to be dropped to maintain the integrity of the selection process, and ensure that county cricketers are not denied the incentive to play for England.